This book presents pieces of evidence, which - taken together - lead to an argument that goes against the grain of the established Cold War narrative. 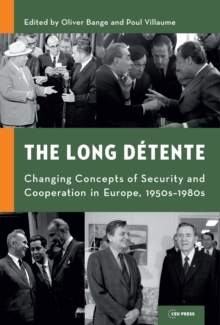 The argument is that a "long detente" existed between East and West from the 1950s to the 1980s, that it existed and lasted for good (economic, national security, societal) reasons, and that it had a profound impact on the outcome of the conflict between East and West and the quintessentially peaceful framework in which this "endgame" was played. By offering new, Euro-centered narratives that include both West and East European perspectives, the contributions of this volume point to critical inconsistencies and inherent problems in the traditional U.S. dominated narrative of the "Victory in the Cold War." Yet rather than replacing this narrative, the argument of a "long detente" demonstrates that this can and needs to be augmented with the plentitude of European experiences and perceptions.After all, it was Europe - its peoples, societies, and states - that stood both at the ideological and military frontline of the conflict between East and West, and it was here that the struggle between liberalism and communism was eventually decided.